Retired Master Sgt. 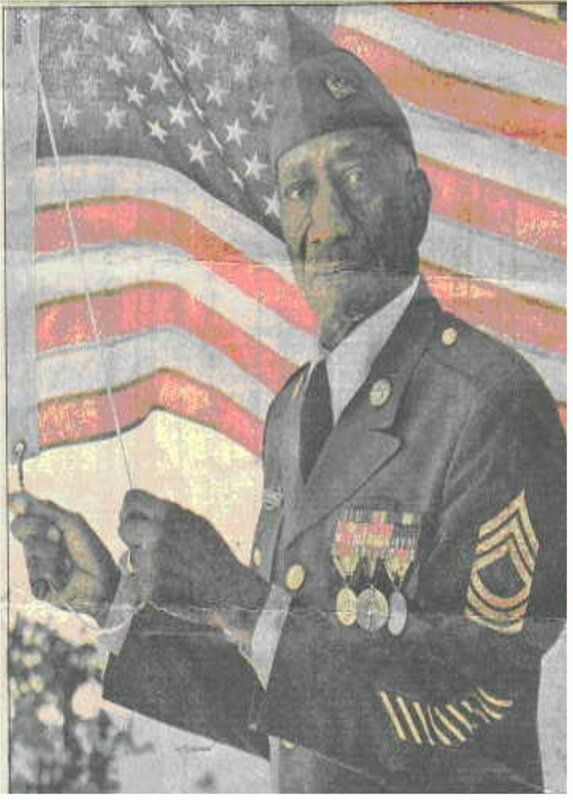 James Clark, once a "buffalo soldier," raised the flag in this 1984 photo. An old cavalryman died here yesterday. He was 86-year-old retired Master Sgt. James Clark, U.S. Army, once a "buffalo soldier," and almost a legend. Duty, country, pride, especially pride, words, to be sure, but ones you could use for James Clark. Although he had been retired more than 35 years, often you could see him in his old uniform in church, in parades or just walking down the street. He stood out, slim, ramrod straight, and you couldn't miss the five rows of medals and ribbons. As a 16-year-old orphan, he lied about his age to get into the Army, his wife, Mrs. Verna K. Clark, recalled yesterday at her home on East Lester Street. He was born in Alabama. At first, the recruiting officers told him he didn't weigh enough, but World War I was raging so they let him stuff himself with cheese and bana­nas so he could beat the weight requirement. He fought in a black infantry unit during that war. Later he boxed, gaining fame as “Battling Pee Wee Clark." He beat everyone and became the flyweight champion of his division. He loved the cavalry, especially as one of the famed "buffalo soldiers." The Indians gave the black troopers of the unit, formed after the Civil. War, that name out of respect and because they thought the blacks' hair looked like that of the buffalo, Mrs. Clark said. He was stationed at Fort Huachuca, an Army fort southeast of Tucson that is still active, for a time, but often said his fondest memories were of the men and horses he served with at Fort Riley, Kan.
"I spent seven years at Fort Riley bouncing my britches on horses brought in from the West for training as cavalry mounts," he told a reporter in 1957. "Some of them (horses) were pretty rank, but we turned out a lot of good ones and had fun doing it. "The old cavalry was a wonderful outfit," he added. "There were a lot of sick troopers the day it was disbanded." Among the officers James Clark served under during his 31 years in the Army was George S. Patton, then a lieutenant colonel. Patton later switched from horses to tanks and became the "blood-and-guts" general of World War II. Mrs. Clark said that her hus­band, too, knew the horrors of that war. He was wounded in combat in Europe and often walked with a limp. Mr. Clark was "a true citizen, a patriot," said the Rev. T. Ellsworth Gantt II of the Mount Calvary Missionary Baptist Church, the church Mr. Clark attended. "He had a pride in his country, a pride many don't have anymore," Gantt said. "He believed in this Country's dream - life, liberty and he pursuit of happiness." And even though during the time he was in the Army, the units he served in were segregated, James Clark never lost his spirit, Gantt said. He had cancer and had been a patient at the Veterans Administration Hospital since Aug. 28. He died just like a good soldier would," Gantt said. "He didn't complain." Other survivors include two stepdaughters, Mary H. Cook of Seattle, Wash., and Verniece Hawkins of Tampa, Fla., numerous grandchildren and some great-grandchildren.